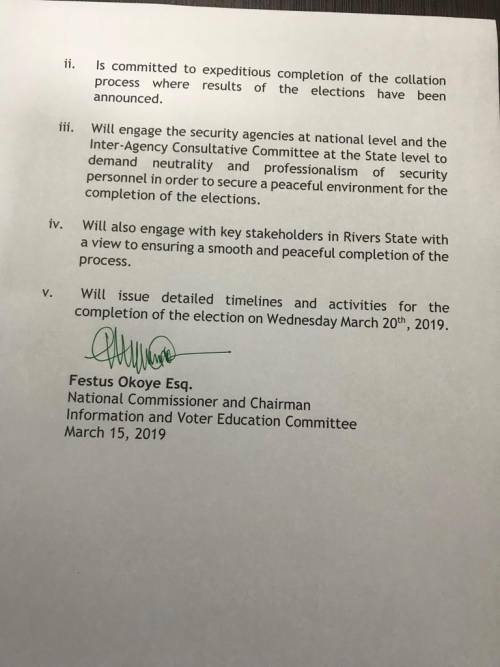 The Independent National Electoral Commission (INEC) says it will issue “detailed timelines and activities” for the completion of the governorship and state house of assembly elections in Rivers State on March 20, 2019. 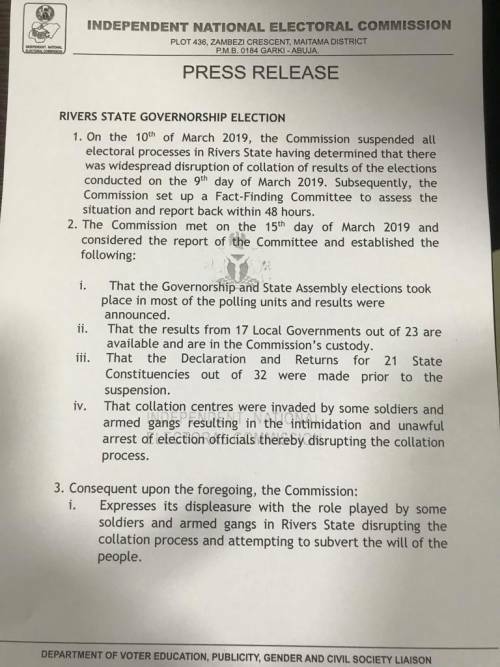 This was contained in a statement issued by Festus Okoye, Chairman, Information and Voter Education Committee, late on Friday, in which the commission blamed “some soldiers and armed gangs” for invading collation centres, resulting in the intimidation and unlawful arrest of election officials, thereby disrupting the electoral process”. The statement by INEC on the outcome of the fact-finding committee read: “That the governorship and state assembly elections took place in most of the polling units and results were announced. “That the results of 17 out of 23 Local Governments are available and in the commission’s custody. The commission expressed displeasure with the situation and promised to engage security agencies and key stakeholders on ensuring smooth electoral process, noting that it will issue “detailed timeline and activities for the completion of the election on Wednesday, March 20th, 2019”.